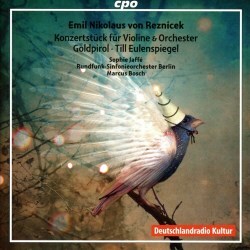 CPO has already recorded a sizeable chunk of Reznicek’s works since the turn of this century and to that reservoir comes this latest disc with its roster of overtures, Konzertstück and other pieces. I suppose the centrepiece will be the Konzertstück for Violin of 1918, a pretty much unknown work as he was unsatisfied with it, retaining the central movement but replacing the outer ones. In that form it became the Violin Concerto in E minor, premiered in 1924. Still unhappy, it wasn’t until 1940 that Reznicek was satisfied with a performance, ascribing this date to its genuine première. As for the earlier work, it has lain pretty much forgotten to such an extent that this recording marks its first performance. There are hints of Mendelssohn and Tchaikovsky, not least in the relationship between the solo instrument and the orchestra. Much remains airy and light and lyric though not much is especially distinctive. True, that salvaged slow movement is tranquil and attractive but the finale sounds like an off-cut from Bruch’s Scottish Fantasia with an admixture of an up-tempo Shenandoah motif. Sophie Jaffé does all she can for it, and that’s quite a considerable amount as she’s a fine, expressive player, but it remains not much more than a curio. The other work she plays is the Nachstück which is quite a sweet and salonish kind of piece though at one point the harmonies darken and the landscape turns somewhat chilly and at around 4:40 the harp announces a ghostly kind-of reflection on the Adagietto of Mahler’s Fifth Symphony. This allusion is not explicable in the context of the music itself, of course, though it is clearly significant thematically, and perhaps bears a biographical meaning. At any rate, it’s an intriguing piece. The overture to Goldpirol – the Golden Oriole in English – possesses Alpine freshness and song born on the updraft. The nature depiction, however, is not wholly serious as there can be found a wittily ponderous quality not wholly unreminiscent of a brewery wind band. Strong burnished brass concludes this confident, pastoral exercise which is well worth a listen. There are more brassy calls to attention in Wie Till Eulenspiegel lebte – Till very much the pugilist – in a symphonic interlude from his 1900 opera full of momentum and Straussian echoes. Reflective lyricism and saucy devil-may-care charm are strong Reznicek tropes. The premiere of the Praeludium and Fugue in C minor was conducted by none other than Richard Strauss himself and this is only its second performance. There is perhaps a Brucknerian impress to some of the writing and it’s, fortunately, by no means a conventional Bachian tribute or, worse, pastiche. Some of the booklet notes make quite remarkable claims for Reznicek here, seeing him as a polystylist avant la letter, certainly in the context of the Konzertstück - but don’t let that put you off. These genial, generous works are beautifully and lovingly played and recorded.